Are you looking to add a bit of flair to your home, but are unsure of how to go about it? At FoxDen Decor, we believe that style is all in the details. With special touches throughout your home, like key pieces of rustic furniture, you can make a big statement without being too flashy. When it comes to making changes to your home, it is not only the dramatic home renovations that make a big difference. Not everyone has a budget that allows for a complete overhaul, so it’s best to make a strong statement in your home with a few key pieces of furniture. This way, you can update your living space without breaking the bank. At FoxDen Decor, we have a wide array of rustic furniture to choose from. Each of these pieces has the ability to transform a room from boring to special; it’s all in the way you display each of these creations! Is your television the center of attention in your current living space? This is very common in our modern, technological world, but there are many ways to design a dynamic space, even around a large television. Many television stands leave much to be desired, which is why a rustic TV console from FoxDen Decor might be just what you need to take the focal point of the room away from the television set. Our rustic TV consoles are all hand crafted from solid wood, and each piece is a unique creation. Have you ever had anything designed specifically with you in mind? As each of our TV consoles are handcrafted, they can be fully customized to meet your needs. Whether you have an extra-large television that needs more space, or you have an eclectic taste that you’d like reflected in your furniture, let us know! If you’d like to take the rustic style to the next level with the use of reclaimed wood, we’d be happy to help you achieve your goals for this piece. Every item that we create is custom made to order, so no two pieces are exactly alike. You have control over every element that is incorporated into the finished design, and you’ll have a number of options to consider when deciding what style you’d like to bring to your living space. You can choose light, medium, and heavy distressing on the wood that will be used to build your TV console, and you will also have freedom with the colors and finishes that are used. With everything from Fiesta Red to Rustic White, FoxDen Turquoise to a simple Medium Wax, we’re sure to find the perfect finish for everyone. At FoxDen Decor, we value quality. From the solid wood that is used to construct each piece of furniture to the exquisite finishes that make each design unique, we take pride in our craftsmanship. Because each piece is custom made to order, certain products may take an extended period of time, or typically between six to eight weeks to complete. We want to ensure that all of our customers are 100% satisfied in working with us, and we will respond to inquiries seven days per week. Contact us today via email using [email protected] or by phone at 1-888-666-1113. 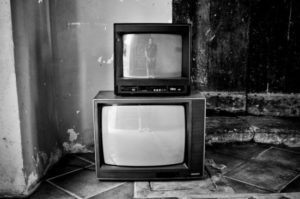 Television consoles have changed dramatically over the past couple of decades. As little as 20 years ago, consoles were designed to be an elaborate showpiece and storage unit all in one. They were large and bulky and designed to hold not only your television and media, but also all of your VHS and DVD movies. They had multiple shelves and generally occupied an entire wall or section of your living room. They were designed to be large and showy and often were highly decorated with wood carvings or patterns. As televisions changed, so did consoles. Small, lightweight, and thin televisions become more popular, along with the option to hang them on your wall. The preference for consoles changed to smaller units that were functional, but less noticeable. The idea of consoles were now of something that held items such as PVR boxes and DVD players, but which could be stored out of the way and preferably out of sight. Sleeker styles, such as consoles made from glass, became more preferred. With the demand for rustic decorative interiors, we have seen another change in the demand and preference of television consoles. While televisions are still preferred to be as thin and lightweight as possible, the decorative element around it has changed. Rustic TV consoles are now becoming a highly sought-after furniture item. The difference with a rustic television console is that, not only is it considered to be a part of the room’s furniture, but it also serves a dual purpose: to both decorate and conceal unsightly cords and other electronic items. While most prefer a console that is small enough to hold only the electronics, they also prefer a console that complements their room and ads to the décor. A rustic tv console provides both a decorative and functional element to any room. Whether or not your television is placed directly on it or hung above it, the console adds to the look and feel of your room. We custom make each piece to your specifications. Each television console is designed to fit your specific room. They are built with your exact needs in mind, hence creating an item that will look and work exactly as you had envisioned. Our consoles are custom built from reclaimed wood. Not only do you receive a custom designed piece of furniture, but you are also receiving an item made from wood that had a part in history—wood that has a past story to tell. Reclaimed wood is wood that has been reclaimed from previous structures, such as century old homes, decks, and other structures. No two pieces of wood are the same. In addition to the uniqueness of each grain. Each piece of wood has already gone through its natural weathering process. This wood will not warp or shrink. Its look is unique and genuine. Rustic and country styled homes are a highly sought after look. There are thousands of molded items available on today’s market that are designed to carry this rustic look, but which are made from particle board and other molded items. Rather than imitate a look, why not go after the real thing? If you are looking to redecorate or add to your current look. Talk to us about our custom TV consoles and what design you had in mind for your particular room. Suppose you want to incorporate a retro farmhouse theme into your decor. Suppose you want a television console to fit into your decorating scheme as if it was made just for your television — in 1920! You can do that. Today’s television flat panel screen rarely looks out of place in any home’s decorating style—especially since we are so accustomed to seeing one in any room in our house. So essential is the television in our homes that we could as easily incorporate one into a starship captain’s quarters, or into Laura Ingall’s parlor, if either extreme were to fit your decorating plans. If you are looking for a rustic TV console to fit in with the rest of your theme, it can be done quite easily. Here are some tips. First of all, forget that rustic and television are not words that go together. That’s not a problem. Everyone has to make room for modern electronics in their rooms, and if they don’t blend with the vision, then so what? Your very large, flat panel screen is a dark rectangle when its switched off, and when its switched on, you are watching it, so you don’t notice if it doesn’t match. However, if it really looks out of place, but is still wanted, then include sliding cabinet doors in the loveliest wood you can find and fence that tv screen away when you are not watching it. Let yourself forget about the modern for a while so you can feel like you are a part of something older. A rustic tv console must be large enough to hold the television—this is the most important requirement. As electronic gadgets get bigger, flatter, heavier, or sometimes even more solid, it is important that the console be big enough to balance the weight. That is, the actual weight of the device and its size must not look like an accident. Make sure the tv screen fits. But it also needs to balance aesthetically. The screen should be visually proportionate. Choosing rustic furniture to bring a sense of beauty and gravitas into your home is easy. FoxDen Decor makes beautiful furniture from solid wood, and it can be customized to exactly your specifications. Each piece is unique, and each piece will make its own statement. Rustic will never look out of place with your electronics again. We live in a world that is run by technology. There is nothing wrong with that—we all enjoy being able to talk over long distances, cook our food quickly and easily, and enjoy a movie or TV show at home with our friends and family. As our technology gets more advanced, however, it can sometimes feel like it is taking over. A large screen television is a wonderful thing, but it takes up a lot of space, especially when combined with speakers, game consoles, a large stereo system and other accouterments. How can you make your front room feel more like a home and less like an electronics gallery? FoxDen Decor’s rustic TV console is an excellent place to start. While electronics can be beautiful in their own right, there is nothing quite like the gorgeous color and texture of rustic natural wood. 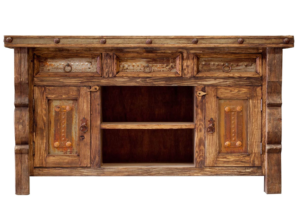 FoxDen Decor’s rustic TV consoles are made to look beautiful, natural and homey, with lovingly carved handmade detail. We leave plenty of space on our TV consoles for you to add your own keepsakes and other personal touches, as well as providing discreet storage space for cables and other less attractive television necessities. Your front room will start looking like a cozy, inviting home theater right away, rather than just a place where the TV is kept. We’ve all seen what happens when low quality furniture enters the picture, and TV stands are an especially problematic piece of furniture when they don’t work properly. Remember that your console will not only be supporting a heavy and very valuable piece of equipment, it will also be containing some very important items, like your DVD player, your video game consoles and your favorite games and DVDs. FoxDen Decor’s rustic TV consoles are built to provide maximum protection for your valuables. You will never have to worry about them breaking, losing their doors or becoming ugly with age. With a bit of love and care, your TV console will last for years looking as lovely as the day you brought it home. Your home is your castle, made to your standards, and your TV is something you selected specially to fit that space. We understand that, so FoxDen Decor’s rustic TV consoles aren’t mass-produced with the expectation that you’ll find a way to make them fit. We make each piece to order, allowing you to specify materials, design, size and every important detail. We even offer the option to have them made with our stunning reclaimed wood. Your TV console will be a one-of-a-kind work of art, made especially to warm and beautify your home. If “rustic” is a style that feels right to you, don’t stop at our rustic TV consoles. FoxDen Decor makes a variety of other beautiful, hand-made furniture to give your home a personal, natural touch. Each piece is custom made to your specifications. If you enjoy our TV consoles, consider making our rustic furniture a theme in your home. The world of home decor changed in the 20th century because of the invention of a single device. That device turned living rooms, places where people would often arrange furniture in a circle to facilitate conversation, into a completely different type of space. One where families would gather facing a single direction, and that direction was towards the television set. Yes, it was the humble TV that made living rooms forever different. But many people, despite rearranging their entire living rooms around the TV, still insist on making the single most looked at piece of furniture in their entire homes completely run of the mill. Not only is this a seeming waste of potential, but replacing your old TV stand is an easy way to completely change the look of a room. Here’s a few reasons to choose a rustic TV console from FoxDen Decor. Here at FoxDen Décor, we specialize in reclaimed wooden furniture, pieces that combine the needs of today’s homes and families with the look of days gone by. With our rustic TV consoles, you get beautiful pieces that are all hand-carved from single pieces of wood. These pieces are not only strong and long-lasting, it’s wholly unique and made from beautiful wood. The consoles can also be made from refurnished wood, if that’s your preference, to further emphasize the old-timey feel of vintage furniture. So if your home or living room is going for that older style, a rustic TV console from Fox Den Decor can fit in perfectly, or stand on its own as a beautiful centerpiece to your home. But on top of the beautiful wood, every rustic TV console is completely customizable to your specific needs. So instead of finding a piece that approximates your home, your decor sense, and your television’s dimensions, you can have one custom built that fits everything perfectly. This will help you keep a solid design sense throughout your room, all while giving you something that will fit seamlessly into your home’s unique layout. And for those who need the perfect placement of their TV for the perfect viewing experience, the customization means it will fit in exactly where you need it. 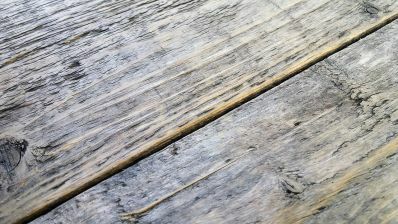 When you buy furniture made from single pieces of wood or reclaimed wood, color and dimensions are important, but so is the quality of the piece itself. Fox Den Decor takes pride in building pieces that are meant to last, rather than pieces that look good at first but fall apart as the years go on. Our internal standards, such as our dedication to our craft and our outstanding customer service, have started to make headlines on their own. Awards and features for our products have appeared on HGTV, and we’ve also received Best of Houzz 2015 award for our exemplary customer service. 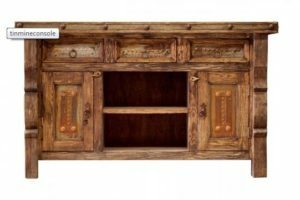 If you’re on the market for a rustic TV console, we at FoxDen Decor encourage you to look through our catalogue and see how our custom furniture pieces could change your home’s look and feel. The combination of high-quality construction and old-fashioned stylings could be exactly what you’re looking for.